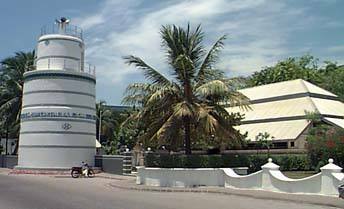 Foreground- right was the site of the maulood pavilion in Malé now demolished under pressure from fundamentalist mullahs. That was where Andiri Andirin ("Goa Kalhu Faranji") found his mother's chandelier and helped himself to a plate of maulood rice. Maulood or mauloodh in the Maldives was sung mainly in Arabic, in praise of the Prophet Mohamed. The ritual was probably influenced by Shiism and Sufism. The Shia who practise Shiism are followers of Mohamed's grandson Hussain ibn Ali. Maldivians, by and large, are now Sunnis who are followers of those who assassinated Hussain ibn Ali. The Maulood was never totally approved of by the official Sunni clergy of the Maldives. During the time of the monarchy, the kings, nobles and civil officers kept the Islamic clergy in check. Without these traditional checks and balances, the clergy and the more radical, foreign-inspired fundamentalist missionaries are on the rampage, imposing their will on most walks of life in the Maldives. "Hassan Fareed went missing during the month of Rabeeul Aakhir 1363 H. [March/April 1944]. He had completely prohibited mauloodh ceremonies from all the Maldive islands when he first assumed power. For about eight years, the mauloodh was not heard and then, when Hassan Fareed died, Ameen Didi permitted the ceremonies again. Everyone was very happy to be holding the mauloodh again." Source: Manik, Abdul Hakeem Hussein, Yesterday (Iyye), Maldives, Novelty Press 1997, p. 20. Translated by Fareesha Abdullah and Michael O'Shea, 2002. From 1153 until 1557 the official sect of the Maldive Sharia law was the Maliki school of Sunnism. From 1573 the official sect practised by Maldive Sharia courts is based on the Shafii school of Sunnism. There have always been an undercurrent of Shiism in the form of folk rituals until finally suppressed in the late 20th Century by the Sunni clergy. Until about the 1990s there were professional choirs of maulood singers who performed the ritual in private homes for either food or money. Island communities raised funds for an annual performance on a communal basis. The government in Male celebrated certain occasions with a maulood recital. The ritual appears to be suppressed at the moment under the influence of Wahhabi fundamentalism funded by various conservative Arab regimes and al-Qaeda type missionary organisations. �Mohamed died at noon on the 12th day of Rabi-ulawwal on the 11th year of the Hijra. The 1st, 4th, 8th, and 12th of this month are observed as mauloodh at the Maldives.� -H. C. P. Bell. "Certain tribe known as Kurdukuri (Kulhudhuffurhi - ed) united against government. Kaverkuris (Huvarafurhi - ed) joined them. "....began saying Maulood prayers which are forbidden." "Order that no person to travel to the Maldives Islands from Ceylon without written permission from the Chief Secretary"
François Pyrard, , (1570-1621), translated by Albert Grey, assisted by H.C.P. Bell, The Voyage of François Pyrard de Laval to the East Indies, the Maldives, the Moluccas, and Brazil, New York, Burt Franklin 1888, 1937, pp. 146-150. �There is yet another very solemn festival about the month of October, which takes place at night, and is called mauloodh; they say it is the night whereon their prophet Mohamed died. This is the ceremony: they begin a month before the festival, by meeting to elect officers to make arrangements and to supervise; these number at least fifty, all men of quality, and act as our festival organisers. Their duty is to go from house to house collecting from every man the sum at which he is rated, according to his means; they go also to ask people to take part, and to arrange everything; though, indeed, the people of the parish fail not all to assist at this festival, which is diligently observed in all islands. At Malè, I have seen it performed at six places. The king bears the expense of one celebration, which takes place at his palace. At the four corners of the island it is celebrated by the people in their several parishes, and one general celebration for all the people is held in the middle of the island, in front of the principal temple. At each of the six places is erected for the occasion a wooden house, sixty feet long by forty broad, or thereabouts; the roof is of coco-branches; the wood of which it is constructed must not have been, nor may in the future be, used for any other purpose, not even for the festival the following year. The ground is covered with fine white sand to the depth of half a foot. This house within is hung with cotton or silk cloths of all colours, and of the finest and richest description available. Above, to serve for a ceiling, they stretch pieces of cotton cloth, very white and very fine, and to support them they run cotton cords, dyed black, from side to side at right angles and aslant, so cleverly that the white above seems to be cut into squares and lozenges of exactly the same size: it is very neat. On the sand wherewith the ground is covered they spread pretty new mats, on which each one sits, and there are no other seats. On all sides are hung copper lamps to the number of about thirty; each is large and has two wicks, so that it is almost as bright as daylight. By contrivances with air-holes, odorous perfumes are introduced within, though burnt without, for the heat of the place of itself is well-nigh insupportable: only the fumes and the odour come within. There are other conduits, too, for they often wash their mouths by way of refreshment after chewing betel, which they do the whole night long. In the middle of this hall there is a table of the height of the knees, whereon are arranged little wicker baskets, and polished lacquer vessels containing diverse kinds of cakes made of rice flour with coco-sugar, like little macaroons, of the thickness of the thumb: these are excellently well served with all kinds of native fruits. The table is covered with sweet-smelling flowers, while all around are jars containing drinks of different mixtures, chiefly flavoured with ambergris and musk. The whole is covered over with a large cotton cloth worked with a coloured pattern. The people rig themselves out in their bravest style; but only the men and boys are present, and no women. The men of quality of the parish do not go, for it would be beneath their dignity; it is a feast of the common folk. They assemble at eight o�clock in the evening, and sit in places assigned to them, according to their rank, by the stewards of the festival. All night long the chief judge, island chiefs, naibs, and mudhims, with all the rest of the clergy, and other good singers, cease not to chant with all their might in alternation like a choir; nor is their chanting without rule, for some of them who know not how to sing have to take lessons from a master: so the harmony is good, and the singing far from disagreeable. They call this chanting zikuru, and say they are the Psalms of David. The Psalms of David are well-known even among remote Moslem communities (Mungo park, Travels, c. xi). Compare the quaint account of Lancaster taking his leave of the Sultan of Acheh :� �And when the general took his leave, the king said to him, "Have you the Psalms of David extant among you?" The general answered, "Yes, and we sing them daily." Then the king said, "I and the rest of these nobles about me will sing a Psalm to God for your prosperity." And so they did very solemnly. After it was ended the king said, "I would hear you sing another Psalm, in your own language." On the stroke of midnight everybody with one accord lies down at full length with his face to the ground, and so remains for a space of time. Then of a sudden the chief judge or the island chiefs stand up, and all the rest of them, and set a-leaping upon each other as they were madmen or lunatics, crying at the top of their voices, �Aly alas Mahomedin�, again and again, this lasts for some time. I have inquired of them why they do this, and they asking �What?� and I replying, �These mad leapings and dancing,� they told me they knew nothing of having danced or done any such thing, but only remembered that for a space of time they had been rapt with ecstasy and had been partakers of heaven and the joys of paradise. Sometimes the chief judge remains for an hour or more like the dead; they say then he is transported to heaven, and that it is a mark that he is a righteous man. The king does not take part in this festival the whole time; he comes to see what is going on for an hour or two, and then returns. In this manner I have many a time seen it in his company. Fifty persons are elected to minister to the rest; this is a great honour, and there is no one but is glad enough to accept the office, for none but distinguished men and scions of good families get the offer. These officers distribute during the night to all ranks of people, seated in their proper order, a portion of betel and areca, arranged and prepared in a different style from their ordinary (I mean of the common folk, for the king and the great lords always use it prepared in the same way). They give as many as a dozen portions to each person, whoever he may be; in like wise they present to all who have mind to drink, beverages of the country brew, in large copper bowls, exceedingly well fashioned and worked, and with a cover on the top. Now and then are brought like bowls full of water, with basins, for washing the mouth and hands; they would not for the world let a drop of water or any refuse fall to the ground. The people are arranged in lines, and at intervals are vacant spaces for passing between them. Blessings and salutations on you, O messenger of Allah. Blessings and salutations on you, O the prophet of Allah. Blessings and salutations on you, O the beloved of Allah. Blessings and salutations on you, O the best creation of Allah. Blessings and salutations on you, O light of Allah's throne. Despite nine centuries of an almost continuous monopoly of Islam over Maldive spiritual life, Maldivians, with the notable exception of the middle class, have often exhibited a callous irreverence. This attitude has resulted in words such as auguraanu (literally new Koran) which means base vocabulary. The maulood had not escaped the Maldive satirist. In the 19th century it was common to sing satirical songs of the types known as bereki and farihi to maulood melodies. These were sung in the Divehi language. Bereki and farihi were frowned upon by the mullahs but the King Kula Sudha Ira Siyaaka Saasthura Audha Keerithi Katthiri Bovana (Mohamed Imaduddine IV, reigned 1835-1882) enjoyed listening to these songs. His reign was the longest on record in the Maldives. In his reign the mullahs found themselves having to tolerate both the maulood and its satirical versions. The following is an example of a 19th century farihi sung to a maulood melody. In the 1970s and the 80s senior school pupils and others composed and sang their own satirical versions of maulood. The following is the chorus of a song regularly sung at school socials by the students of a higher secondary school in Malé called the Science Education Centre in the mid-1980s. Rice Fatima hauled up on the shoulders! Nasihu's house lit up with hurricane lamps! The correspondent had the following maulood buri to add. The corresponded noted that Fatima's name was often substituted with those of other lucky young ladies. It is also interesting to note that this particular maulood buri was sung to the same melody as the 19th century one given above, which was sung to the melody of "Marhaba ya noora aynee"
Aly alas Mahomedin was probably how Pyrard heard a Shia incantation.